History and symbolism were important to Jackie Kennedy. Years after she left the White House, she worked as a book editor in Manhattan. During that time, she wasn’t just a figurehead for the New York City Landmarks Preservation Commission, her active volunteering helped save Grand Central Terminal from demolition in the 1970s. When she was First Lady, she renovated the deteriorating White House to its former glory. After President Kennedy was assassinated in 1963, she staged a funeral loaded with powerful imagery such as the riderless horse with boots reversed in the stirrups, a symbol first used in President Abraham Lincoln’s memorial. Jackie Kennedy also believed in the importance of jewelry. 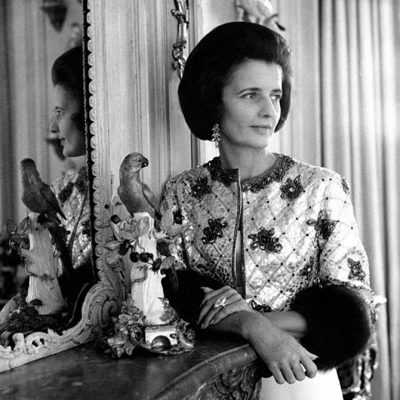 Although she never elaborated on the topic publicly, she once said “Jewelry is epoch making and to me it has a significance of its own.” At State Dinners, beautiful diamonds always sparkled with her glamorous gowns. None of the important diamond jewels she wore during those Camelot days—not one single piece—appeared among the 200 fine and costume jewels sold with her estate at Sotheby’s in 1996. They all remained in the Kennedy family. 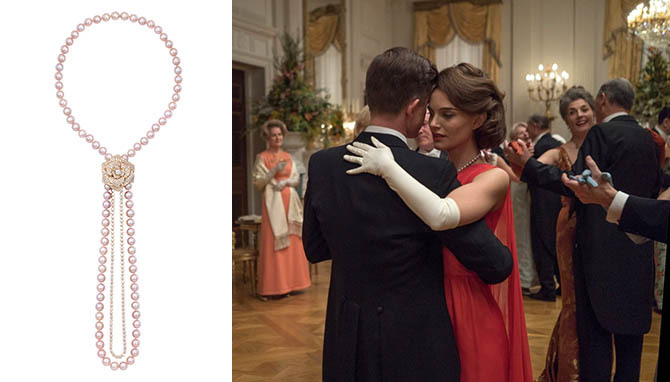 In Chilean director Pablo Larraín’s non-linear biopic Jackie, leading lady Natalie Portman wears amazing jewels at all the state occasions in the film. 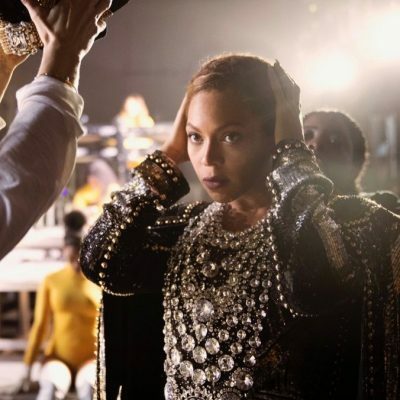 Costume designer Madeline Fontaine treated the jewels the same way she did the clothes that have become so iconic from the photographs. She gave them a small bit of an update for the big screen. Fontaine worked directly with the Swiss jeweler Piaget on the important pieces. For example, at the historic evening on November 13, 1961 when the Spanish cellist Pablo Casals, who had been living in exile in Puerto Rico, accepted President Kennedy’s invitation to perform at the White House, Jackie wore a chartreuse silk faille evening skirt and a crystal beaded and sequined sleeveless shell with a simple boat neckline along with her long diamond pendant earrings. 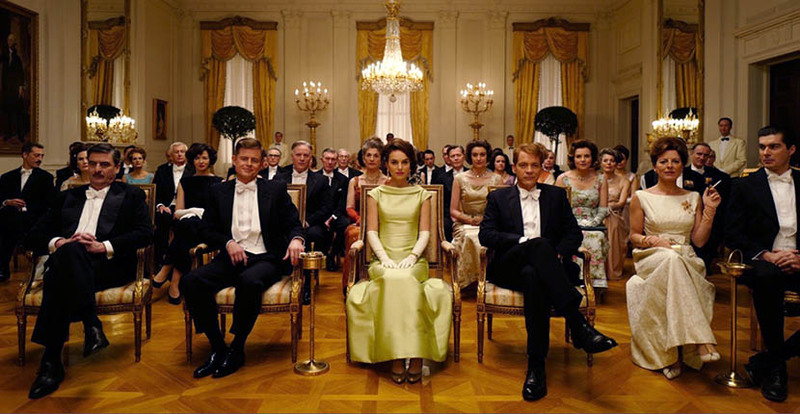 In the movie, when the Casals performance is depicted, Portman’s gown is chartreuse, but the crystals and sequins have been dispensed. The silhouette has been pumped up a bit and dramatized. There is a cap sleeve and a folded over neckline. 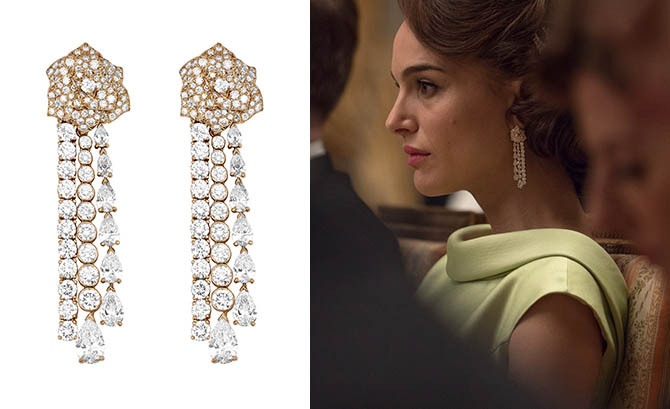 The earrings echo the original silhouette of Jackie’s jewels but they have more movement. The designs are from Piaget’s Mediterranean Garden collection. There are strands with over a dozen pear-shape diamonds weighing over 5-carats and 10 brilliant-cut diamonds weighing approximately 10-carats. Piaget’s signature rose motif forms the top element. In a nod to one of Jackie’s real Piaget treasures, an oval jade watch with a diamond and emerald bezel and a textured gold bracelet, a 2014 rendition of the design made en hommage to the First Lady appears around Portman’s wrist over her long white gloves (see in photo at top). 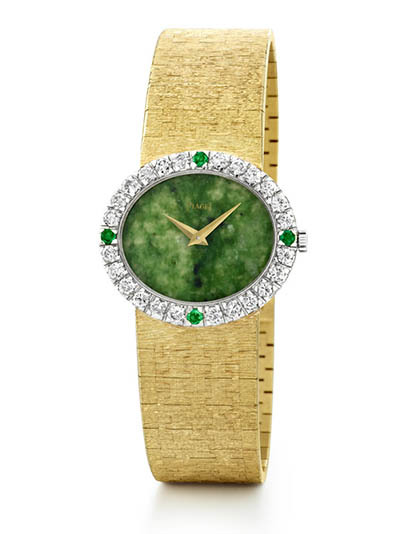 The Extremely Piaget design has a jade dial and is set with 20 brilliant-cut diamonds. Four brilliant-cut green tourmalines accent the quarters. The gold bracelet has a Palace decoration pattern. One of the most joyful moments in the dramatic film takes creative license with the ensemble that doesn’t appear to have an exact historical reference. In the scene, Natalie Portman wears long white gloves and a gorgeous fire engine red sleeveless long gown with a train that flows from her shoulders. Her Piaget jewel references Jackie’s signature pearls but they are much more playful. The amazing necklace is a big long loop of light pink pearls brought together at the center with a diamond rose that suspends a second strand of smaller white pearls. It’s an epoch making jewel.